High time I came back to my ongoing Peacemaking story! I stated last time that it might be a good idea to just use material from the time of the story. 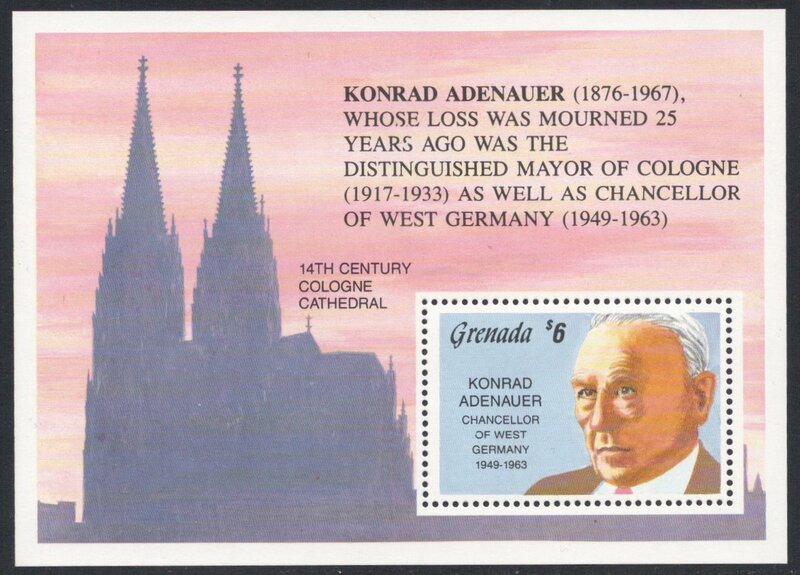 But I immediately came a cropper when I started on the Konrad Adenauer subject. Nothing to be found which was contemporary! 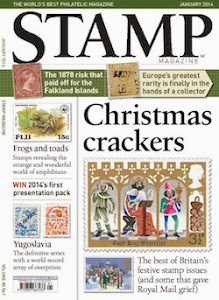 So I had to let that one go and work within the slightly looser framework of using stamps only. 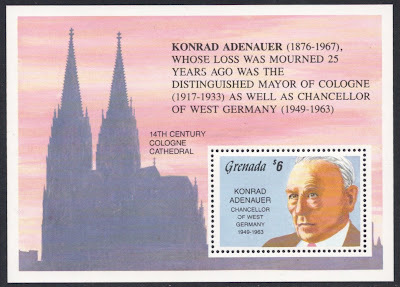 That proved hard enough even though you'd find, if you'd care to take a look, that there are plenty of Adenauer stamps. 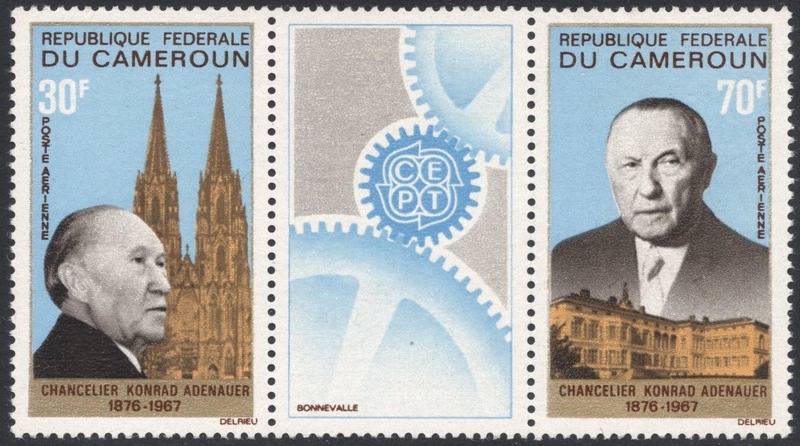 He was, after all, the first West German Chancellor. But that's not what I wanted him for. 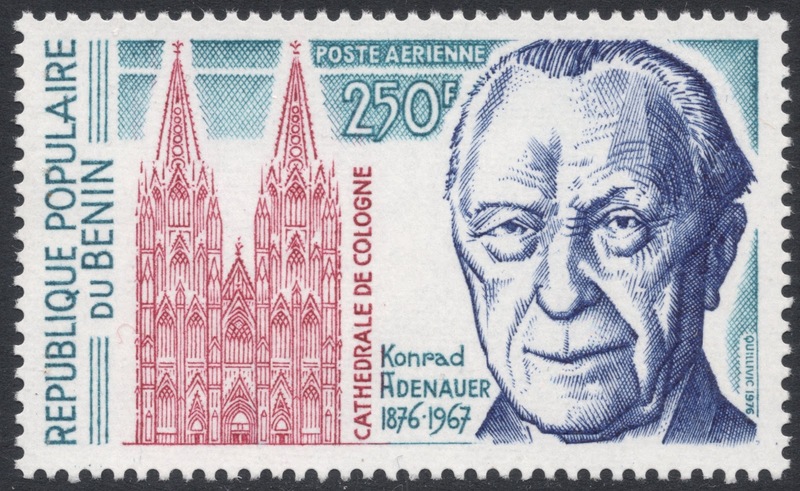 His role in my story centres around his time as Mayor of Cologne in the German Rhineland, just after the Great War. The thing was that the Rhineland, to the northeast of France, was a disputed area just after that war. 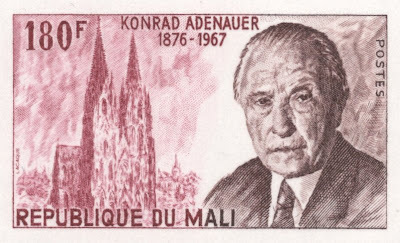 The Germans wanted it as it had been German, the French wanted it as a buffer to guard against possible future German invasions, and in the area itself, the idea of separatism was spreading like a wildfire. Being a mainly Roman-Catholic area, the Rhinelanders had never been happy under Prussian rule, but then again not that unhappy to come running to France. Could an independent Rhineland state be an option? 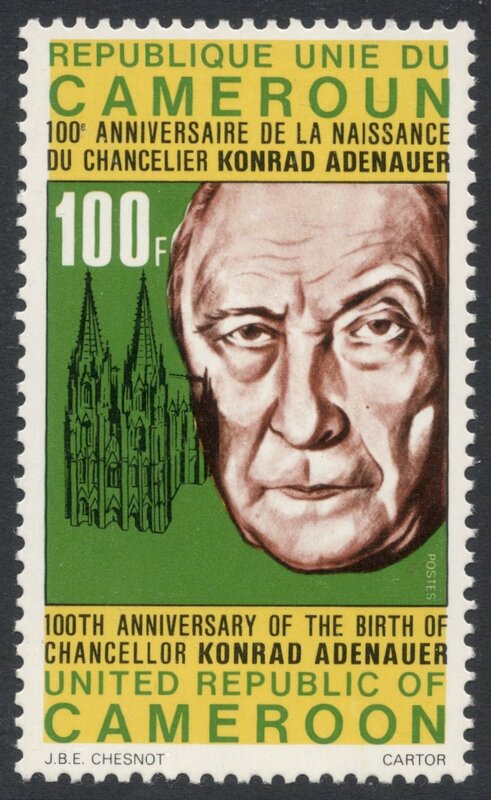 For a while, Konrad Adenauer really thought so and he spearheaded this nationalist movement. But soon he saw that any attempts to create this independent Rhineland state would be futile and probably detrimental to his career, so he gave it up completely, up to a point where he publicly tried to water down his erstwhile involvement. So anyway, what I needed was Adenauer issues which would refer to this time, rather than to him having been chancellor. As you can see from the images here, I did manage to find a few, although I mainly had to settle for indirect references through depictions of Cologne Cathedral. The only direct reference can be found on a 1992 Grenada miniature sheet, which mentions his mayorship in the non-stamp bit.